The big problem with stage scripts is that, when they are published, they are never seen in the correct, production format. Publishers need to maximise the use of space and minimise costs, hence the sort of format you see in Figure #1. (Extract from “Angels in America” by Tony Kushner). Click on the diagram for a larger image. So, we have non-standard font-face (this is actually Baskerville) in a size that would be difficult to read by a long-sighted person without (this is about 9pt). The next thing you will notice is that the stage directions are set in italic, which is a definite no-no for submission scripts. So, number one rule for formatting scripts is – use 12pt Courier font-face. You can use upper-case, lower-case and underline. 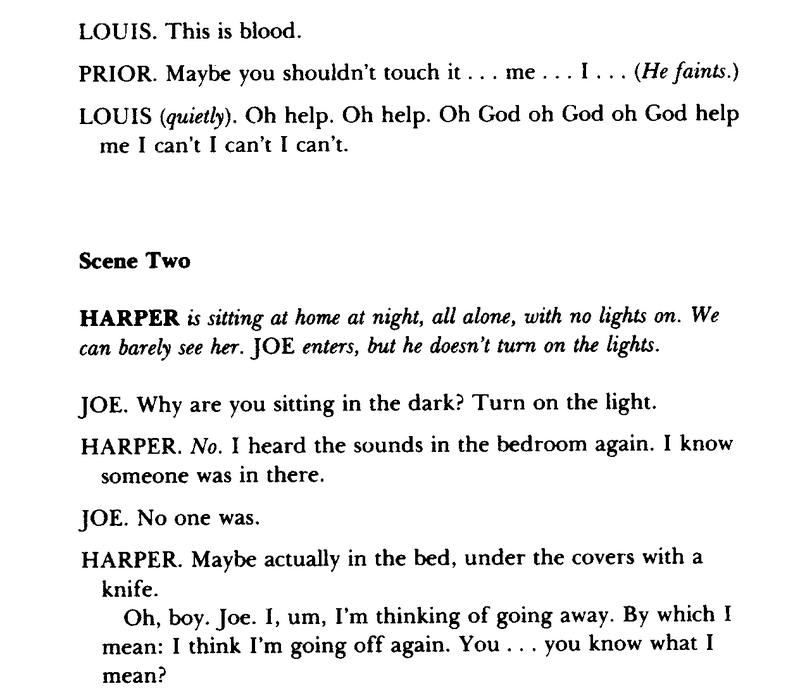 The first thing you will notice about the sample in Figure #2 is that the stage directions stand out from the dialogue. They are typed in upper-case and indented by about 6cm. There is no mistaking at first glance, which is dialogue and which is action. You will also notice that the Act and Scene numbers appear on the same line with no location description, unlike film scripts. These are not necessary because, in effect, there is only one location – the stage. The same goes for radio scripts. Please read the sample page shown in Figure #2 for more detail. Click on it for a larger image. What I have described above is a introduction to the visual element of formatting – presentation element if you will, with very little about the convention of scripts writing. Those will be covered at another time. More detailed instruction can be obtained from the BBC Writer’s Room. One thing I am constantly encouraging playwrights to do is behave like a professional. Part of that is to know your formatting. As a writer and an actor, I often have scripts handed to me that are almost unreadable because the author does not know how to format a script. Most scripts seem to be formatted in a serif font (like Times New Roman) in 10 point or smaller. The dialogue is often centred with left and right indents of about 2cm and the character names don’t stand out at all. Yuch! Well, first of all, my guess is that the scripts that the writer has access to are American film scripts – apart from having a totally different formatting from British film scripts, they are also different from radio, stage, and TV scripts. If they have read a stage play, it is probably a published script that they have picked up from a library. Publishers have a totally different agenda and a different format. Many writers say “what does it matter, so long as you can read it?” well, it matters a lot because it is not in the correct format and, if you want to get taken seriously by any producers, you need to know the industry formatting. Formatting has developed throughout the industry for a reason. Mostly it is to do with the practicalities of being read by actors and directors. Lots of white space means space available for notes and an easier read. Each script is read in different circumstances. TV and Film scripts are read on set and, very often, an actor has to pick it up and learn a page worth of dialogue in a few minutes. Radio scripts are read in a studio by actors who are being recorded while they read off the page. Stage scripts never appear on the stage and are, largely, read in the comfort of an actor’s home. So, here’s the first rule for writing a script. ALWAYS type it in Courier 12 point. Nothing else will do. Why? Well, firstly it is traditional. It has been used since the first film was made, since the first script was type-written. Secondly, it is easy to read. Thirdly, it is monospaced, meaning that the spaces between each character is consistent throughout. Therefore, each line is close enough to equal in character length. Don’t be tempted to right-justify your typing – it screws up the character spacing. Character names should always be in upper case regardless of which type of script you are writing. This makes them stand out. 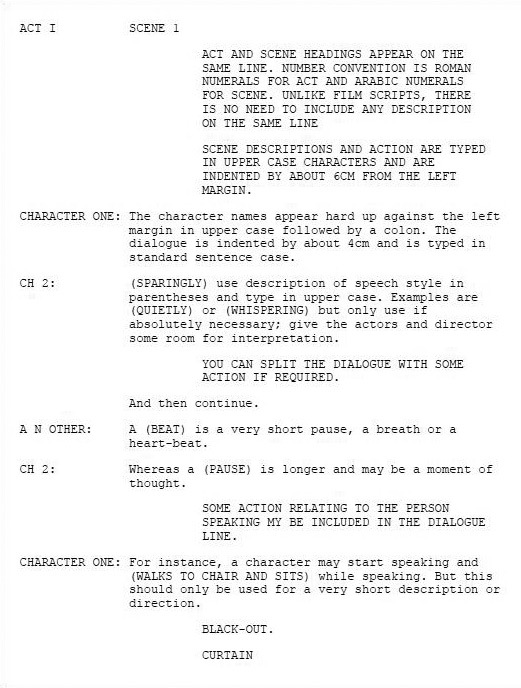 Without going into specifics (more of that in future posts), stage directions should stand out either by their indentation or by being upper case, depending on whether the script is for stage, screen or radio. Do not ever use italics, even though you may see this in published scripts. Scene and act should be clearly indicated. In film and TV this is usually by a short description such as INT. LIVING ROOM. DAY, while radio would just have a scene number. Now for a pet hate of mine – widows and orphans. No, that’s not some sort of snobbery; these are where the character name has been separated from her dialogue by a page break. No excuse. Before ever presenting a script, check through it. As an actor, I can tell you that it is truly irritating to see your name at the bottom of a page and then have to turn over for the dialogue – even worse when I’ve missed the character name entirely because there was no dialogue associated with it. Similarly, if a speech is broken by the page (say two lines at the bottom of one page and one line on the top of the next) put a page break in before the character name if it’s appropriate. NEXT BLOG – formatting for stageplays.